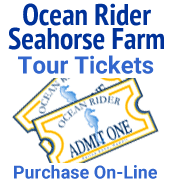 I am pleased to announce that a comprehensive training program for new seahorse keepers is now available to all interested parties from Ocean Rider! Please allow me to introduce myself. My name is Pete Giwojna and I provide tech support for Ocean Rider (seahorse.com). One of my duties in that regard now includes providing a quick training course for new Ocean Rider customers and first-time buyers to get them up to speed on the aquarium care and requirements of seahorses. All newbies are required to complete the training program to my satisfaction before they can be certified and authorized to purchase seahorses, but the training lessons are available to anyone who cares to participate. The purpose of this training is twofold: (1) to assure that the home hobbyist has a suitable aquarium, completely cycled and with the biofiltration fully established, ready and waiting when his seahorses arrive, and (2) to assure that the hobbyist has a good understanding of the aquarium care and requirements of Ocean Rider seahorses by the time he or she has completed the training and been certified. All of which will help to ensure that things go smoothly and that the home aquarist’s first experience with Ocean Rider seahorses is rewarding and enjoyable. Lesson 1: Selecting a Suitable Aquarium & Optimizing It for Seahorses. Lesson 2: Cycling a New Aquarium & Installing the Cleanup Crew. Lesson 3: Reading Assignments (books, articles, and columns devoted to seahorses). Lesson 4: Water Chemistry, Aquarium Maintenance, & Maintaining Optimum Water Quality. Broadcast feeding or scatter feeding — just say no! Lesson 6: Compatible Tankmates for Seahorses. Lesson 7: Courtship & Breeding. Lesson 8: Raising the Young. Lesson 9: Disease Prevention and Control. Lesson 10: Mustangs and Sunbursts (Hippocampus erectus) & Acclimating New Arrivals. I will be providing detailed information on these subjects to anyone who is interested in participating in the training course, and then answering any questions you may have about the material I present. I will also be recommending seahorse-related articles for you to read and absorb online. In short, the training course will teach you everything you need to know to keep your seahorses happy and healthy, and it will arm you with the information you need in order to tackle your first ponies with confidence. It will explain how to set up a new aquarium and optimize it to create ideal conditions for your seahorses. How long this training will take to complete depends on your experience level as an aquarist to a large extent. For example, if you have never kept seahorses before and you do not already have a suitable saltwater aquarium up and running, it will take at least eight weeks for your training and preparations to be completed before you can be certified. It will take that long to learn the basics of seahorse keeping, set up a suitable aquarium, cycle the tank from scratch to establish the biological filtration, and optimize the tank to create an ideal environment for seahorses. Only then can you be certified ready to receive your first seahorses. On the other hand, experienced marine aquarists and hobbyists that have had seahorses before and already have a suitable saltwater aquarium up and running can be certified much more quickly. I will run through the same basic information with them, but most of the information I provide will be familiar material for such hobbyists and they should be able to review it and get up to speed quickly, plus they should have well-established aquariums ready, fully matured that they can fairly quickly adapt in order to make them more ideal for seahorses. In a case like that, certification can be completed as soon as they have absorbed the material I provide and are confident they have a good grasp of the specialized requirements and aquarium care of the seahorses. In order to provide you with the best possible assistance during the training, I will need to know a little more about your background as an aquarist and the type of aquarium you have available to serve as your seahorse tank, So in order to get started, it will be helpful if you could tell me how experienced you are with saltwater aquariums. Have you ever kept a marine aquarium before? If so, how long have you been involved with the saltwater aquarium hobby? Do you have one or more marine aquariums up and running at this time? If so, how long have the tanks been in operation? Do you have an aquarium up and running at this time that you intend to use as a seahorse tank? If so, can you please describe the aquarium system you will be using for your seahorse tank? How large is the aquarium (length, width, and height)? What kind of filtration equipment is installed and running on the aquarium? What type of lighting system does the tank you? How long has the proposed seahorse tank been up and running? Please list all of the current inhabitants of the aquarium you will be using as your seahorse tank, if any. If not, if you don’t have an aquarium for your seahorses as of yet, that’s just fine. I will be providing you with lots of recommendations and options in that regard so that you can pick out a tank that is just right for your needs and interests. And I will be working with you personally every step of the way until your new aquarium is ready for seahorses and you are well prepared to give them the best of care, regardless of how long that may take. I strongly encourage anyone and everyone who is interested in seahorses to take advantage of this outstanding free training program. Go through all the lessons with me and get your seahorse tank up and running in time for the latest crop of Mustangs and Sunbursts, which will be maturing this Spring. The latest generation of Ocean Rider Hippocampus erectus seahorses will be hardier and better adapted to aquarium life than ever before. If you would like to give the seahorse training program a try, just send me a brief e-mail off list ([email protected]) with your full name (first and last) along with the information requested above, and I will get you started out with the first lesson right away. I’m a knew aquarist and I’ve recently taken an interest in seahorses and have decided to start a tank devoted to them. I’ve gotten a lot of information from Seahorse.com and now I’m interested in getting certified and taking the lessons 1-10. Excellent! I have your e-mail address from your follow-up message and I will contact you off list with the necessary information and get you started on the lessons right away. You should receive the first lesson no later than Monday, January 18. Best wishes with all your fishes, Jocelyn! Welcome aboard! Great :woohoo: I m very much interested in enrolling myself for training program for new seahorse keepers. I m having marine aquarium for last 3 years ( size :- L 5ft, H 3ft, B 1ft 6inch). Truly I have never kept Seahorse in my tank as I didnt had any knowledge on Seahorse keeping. And was never confident that i could give proper care to them. But always dream of keeping a tank fully devoted for such gentle pets. Please enroll me in your training program which is via email. So that i can educate myself in careing and keeping of seahorse. It’s me Jocelyn I was looking at the website again and I just found out that Ocean RIder doesn’t ship within the state of Hawaii. I can understand why and I was just wondering if you could maybe recommend some seahorses that I can find on the island of Oahu. This would be much appreciated. Thanks so much. Yes, you’re quite correct — Ocean Rider (seahorse.com) does have a strict policy against selling any of their livestock within the State of Hawaii. This limitation is necessary to prevent the accidental or intentional release of seahorses that are not native to the islands into Hawaiian waters where they may have a negative impact on endemic seahorses and ecosystems. The release of captive specimens is widely acknowledged to have the potential to do considerable harm under certain circumstances. The primary concerns are that such releases could introduce diseases into seahorse populations, could pose genetic threats to wild populations, and could disrupt the structure and normal function of seahorse communities, and may therefore actually result in extirpations (localized extinctions) of native seahorses. The fact that Ocean Rider cannot provide livestock for you will have no effect whatsoever on the training lessons since you do not have to have Ocean Rider seahorses, or seahorses of any kind, in order to participate in the training course. However, seahorses are still being imported into Hawaiian from sources other than Ocean Rider. Under the circumstances, your best option for locating seahorses will be to contact the local fish stores in your area and ask them to notify you the next time they receive a shipment of seahorses. (I am not in a position to recommend any particular pet shop or fish stores.) As always, Jocelyn, captive-bred-and-raised seahorses are much preferable to wild-caught seahorses or pen-raised ponies, when you have a choice. Lesson 9 (disease prevention and control) discusses how to screen seahorses from the pet store to make sure they are healthy before you make a purchase, so be sure to keep those guidelines in mind when you are selecting a seahorse from your local pet store. Best of luck finding the perfect ponies for your new seahorse setup when the time comes, Jocelyn! That’s just fine! I have received your follow-up e-mail off list and you are now officially enrolled in the Ocean Rider seahorse training program. In fact, by the time you see this message, you will probably already have received the first two lessons. Best wishes with all your fishes, Sadanand! And good luck with the training course. I would like to take the seahorse training course. How do i go about getting the info to complete? So just shoot me a quick e-mail off list with the information requested above and I’ll get you started out on the training program right away, TJ. Pete. I would like to take your seahorse training program. My wife and I were at the facility a week ago. It’s a fantastic place, I’d love to work there.I have had aquariums for atleast 25 yrs. Saltwater for about 15 yrs. I have a 55gal freshwater, a 40 gal. salt, a 10gal. salt. a30 gal. fresh, and a 2500 gal. pond in my backyard for koi. The horses will be going into the 40 gal. which measures(36in. long x 20in. tall x 12in. deep. Ready to get started! So just shoot me a quick e-mail off list with your full name (first and last) and I’ll get you started out on the training program right away, Ross. I would be interested in your course. I have been keeping H kellogi for over a year and a half and have been into aquaria for 20+ years. Excellent, sir! If you have been able to keep your delicate Hippocampus kelloggi seahorses alive for a year and a half, you are obviously doing a lot of things right already, Scott, but I would be very happy to enroll you in the seahorse training program. So please send me a brief e-mail off list including your full name (first and last), which we need for our records, and a brief description of your H. kelloggi aquarium and how it is equipped, and I will reply with the first lesson right away. Not only have I learned so much about seahorse raising I now feel that I have a go-to source for information without sorting through a plethora of conflicting info and opinions. I would recommend this course to anyone who keeps a marine system with or without horses. My LFS currently has three ponies that where sent to her along with the two I had ordered. She hid them in her office tank away from the public as she didn’t want to let them go to anyone not prepared to house them properly. I told her about this course and she agreed to make any prospective horse keepers take your course prior to adopting. The three ponies in the office are now safe as when she mentioned selling them her husband (whom never had shown an interest in any of her fish) has fallen for the horses. She says he spends hours watching the horses where that time before had been spent on line.